In many countries, driving is a serious cultural issue. For the British, the Parisians are erratic drivers; the French think the Italians behave madly behind the wheel while for the Americans, all Europeans drive too fast. 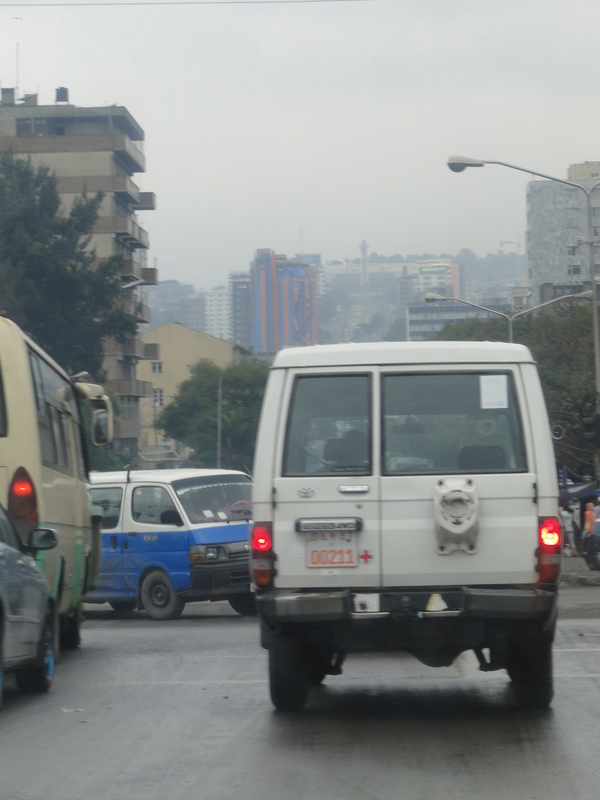 Driving in Addis puts those minor cultural differences into a new prospective. According to the World Health Organization, Ethiopia has the worst record when it comes to road accidents. It is the most dangerous place to drive in, and as visitors we are strongly recommended to drive as little as possible, hence the common use of a driver. I thought the warning was a little exaggerated until I went on my first evening outing. During the day, people drive nervously and erratically, avoiding each other by an inch only, cutting through traffic, zigzagging through cars or stopping in the middle of the road. In particular, the old blue Toyota minibuses are notorious for that. An experienced driver is able to handle this kind of traffic relatively well, and I must say I feel safe with our driver. However, it is at night that one begins to understand the danger of driving here. The streets are hardly lit; many people walk on the road or sit on the narrow pavement, not realizing that they can’t be seen. They carelessly cross the road, or suddenly step out at a traffic light, like shadows in the dark as cars get near them. We heard of a number of accidents where people were knocked over, but luckily they were not critical. Many of the people on the street at that time are homeless beggars, who end up sleeping on the pavement at night. When coming back from our evening (we went to see an Ethiopian reggae-rap band called Zion Rebels at the Franco-Ethiopian Alliance), we had to walk about a kilometer to the main Churchill road to find a taxi. It was an eye opener: I had never seen so many people sleeping on the street. We see homeless people in London, Paris or Rome, but never in such a high concentration. On a stretch of only about 50 metres, I counted at least 60 people sleeping, 60 bodies (adults and children) lying there wrapped in old blankets. How do we deal with it? We don’t forget, but we put it at the back of our mind to be able to carry on with our own life. And so we stepped into a taxi, an old LADA, spurting out clouds of black smoke, with a lingering smell of petrol inside. It was like entering a different world, a mixture of cool and kitsch, ornate to the limit, just enough to give a strong sense of atmosphere. Religious icons and Ethiopian flags were hanging at the rear mirror and harmoniously placed on the dashboard, while multicoloured lights were flashing at the back in rhythm with the trendy music being played, which was so loud that we could only forget about the outside world. It was a colourful moment! This entry was posted on October 3, 2011 by Salambo in Addis at first sight and tagged Addis Ababa, churchill road, LADA taxi, road, road accident, WHO.